If you do not want to use FusedAlti in altitude measurement, you can disable it in the options menu. Keep Next pressed to access the options menu. Scroll to FusedAlti with Start Stop and select with Next. Set FusedAlti Off with Start Stop or Light Lock and accept with Next. When the device is in time mode, you can search a new reference for barometric altitude with FusedAlti. This activates the GPS for a maximum of 15 minutes. Scroll to Reference with Light Lock and enter with Next. Scroll to FusedAlti with Start Stop and select with Next. GPS is switched on and the device starts calculating altitude based on FusedAlti. 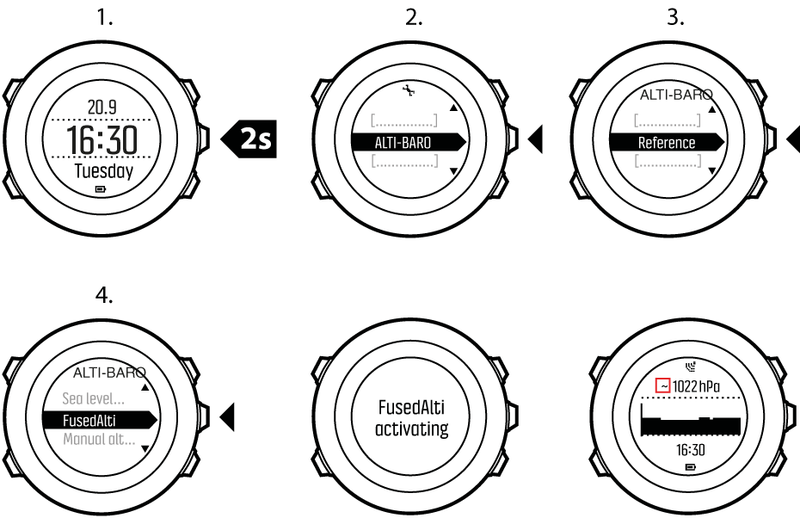 In good conditions it takes 4 – 12 minutes for FusedAlti to activate. During that time, Suunto Ambit3 Peak shows barometric altitude and ~ is shown with the altitude reading to indicate that the altitude may not be correct.